[1995 USGS Topo Map Zoom] and Google Earth [KML File] I may find time to post a more detailed KML file, but something is better than nothing. You can click on the places in Google Earth to zoom to a couple of different views. 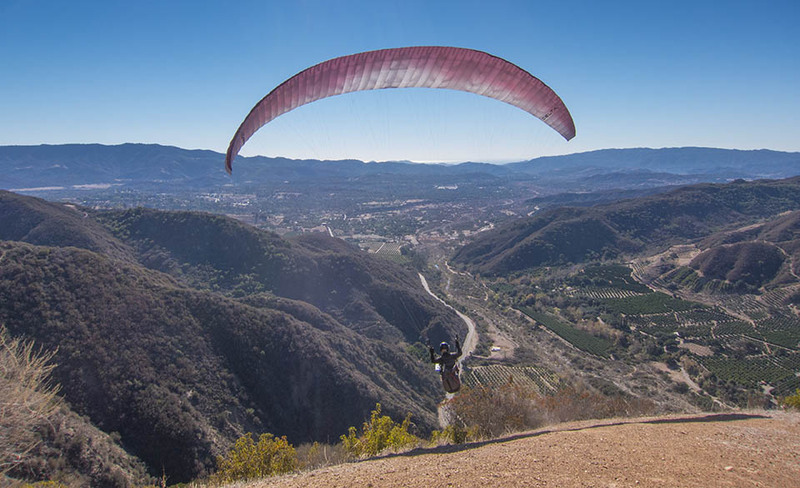 The Nuthouse is a hike up launch in Ojai off Hwy 33 about 450 yards up the road from the Cozy Dell Trailhead or 350 yards up from the Friends Ranch Packing House (blue building with a white roof). The initial 20 to 50 yards of the Nuthouse Trailhead is on private property, but just a little ways in it is Los Padres National Forest. The trek to launch is borderline between a hike and a climb. If you have a 50 pound pack, I recommend gloves or a walking stick. Without a walking stick, there are some sections steep enough that you will reach out for hand support (many pilots use a walking stick, but I grapple with both hands). Good footgear is recommended. Long sleeves and pant legs are recommended even in the heat to avoid bug bites and scratches. I carry a hand towel to dab the sweat from my eyes, others wear headbands. Budget a quart of water for the hike in addition to what you want to fly with for emergency reserve. We often fly the Nuthouse in the fall, winter, and spring during Santa Anna weather, so it is usually hot during the hike. It is generally better to start up early to minimize the heat. Plan to sweat even on cool days. Some of the young athletic hikers can clock up in less than 30 minutes, but most middle aged pilots budget 45 minutes to an hour plus for the climb. If you are older or in poor physical condition, you might want to budget an hour and a half. The Nuthouse is on the west side of the Nordhoff Ridge mountain mass. It doesn't have much east exposure, so you can't launch as early as someplace like Nordhoff Peak. On good days, its typically soarable by 10 or 11 am PST, or 11 to 12 PDT, but with a south west exposure for the triangular front face, it works better later in the afternoon. The Nuthouse is not so much a "Flying Site" but rather a low gateway to a flying site. You don't usually get very high at launch. Pilots typically bench up close to the east west ridge (2750 MSL ~ 850 feet above launch) and then dolphin over to Spine One. The point on Spine One is about 32 hundred. You can come in about a third of the way down the spine around 27 to 2800 and still reliably get up. You can get up lower, but if you are that low, you are probably pushing uphill too aggressively and should have earlier considered falling back downhill to the west. Once established at Spine One, you are in the game. Pilots don't typically hang out at Spine One because you can usually get higher continuing east over the next front peak called the Pyramid, and further east along Nordhoff Ridge. If you can't get high enough at Nordhoff Ridge to cross Hwy 33 westbound, then you might consider continuing on toward The Stooges and Twin Peaks to climb up the Chiefs Spine for better altitude over higher terrain. It is common for pilots to launch from the Nuthouse and top land on Chiefs Launch (about 4800). Since we often fly the Nuthouse on east days with the intention of flying west (downwind) to Santa Barbara, we regularly encounter flow with an east component from NE to SE. It will usually be east around launch even on typical SW days, especially during the summer and strong spring days because the launch location is east of the river gap and the upriver flow wants to funnel into the gap from both the east and west. The nuthouse blocks a NE Santa Anna very good because it is in the lee of Nordhoff Ridge. It isn't as effective at blocking a SE flow common in prefrontal conditions or some Santa Anna events, and I suspect it is even less effective at blocking a NW post frontal blow. I haven't flown the site as much as some of the locals, but to date (1/2014) I've never had to hike down from launch (knock on wood) and I often fly it on days with 5 to 15 knots of NE at altitude. As noted, on SE days the west side of Nordhoff ridge often doesn't block as well compared to NE days. Most of the time you start to get out of the river draw (flow from the east toward the river funnel) around Spine One, but on SE days, you can encounter increasing east wind around the corner of Spine One. In that scenario, you may need to try crossing Hwy 33 westbound lower, but at least it will be downwind going across. Altitude needs vary with conditions, but I typically like to have 45ish at Spine One and 55 or better at Nordhoff to get across Hwy 33. We usually fish for altitude at least as far as Nordhoff, but sometimes turn around and leave from the Pyramid or Spine One. On glide, it is good to be out front because you will likely encounter river/gap draw from the opposite direction west of Hwy 33, and the two ranges are staggered such that the White Ledge Ridge is a bit further south than the Nuthouse Ridge. If you leave from the Nuthouse Spine itself (behind launch drifting west), you might be in for an upwind glide trying to get around the corner against venturi flow. You can cross Hwy 33 eastbound much lower than going the other way. The Nuthouse works ok-ish in the morning, but by the afternoon, you can often come in quite low and still get back up. I've gotten there 200 above the road and still been able to snake back up. I've never flushed at the Nuthouse crossing Hwy 33 from Santa Barbara (2014 knock on wood), even coming in low. If you try to cross 33 westbound and come up short, you can still typically fall back downwind to the Nuthouse and reboot. To fly west to Santa Barbara, I like to see a 6K winds aloft forecast of about 5 to 10 knots from the ENE. The 6K temp is often cooler when there is a little north in the upper flow, yielding a better lapse rate , and as noted above, the Nuthouse Ridge is typically more protected from NE flow than SE. On NE days at altitude, it is typically SW down lower. East flow down low is more likely on SE days. Having noted my preference, we do fly it in varied weather, and you can't order up a serving for Saturdays. I've had many flights back to Santa Barbara on prefrontal SE days, but the big altitude seems to be more common when it is NE up high. In the summer time, you can pretty reliably get to Twin Peaks and the Chiefs spine, so you can get anywhere you could get from Chiefs Launch. Beware that in the summer months, the Ventura River Gap draws strong up Hwy 33 so expect a Venturi Compression over the ridge. Pilots have been blown Over The Back (OTB). When the wind is up or the backcountry draw is strong, stay a little out front and avoid getting over the ridge because the velocity will be higher over the ridge (concept extends to most ridge lift sites). 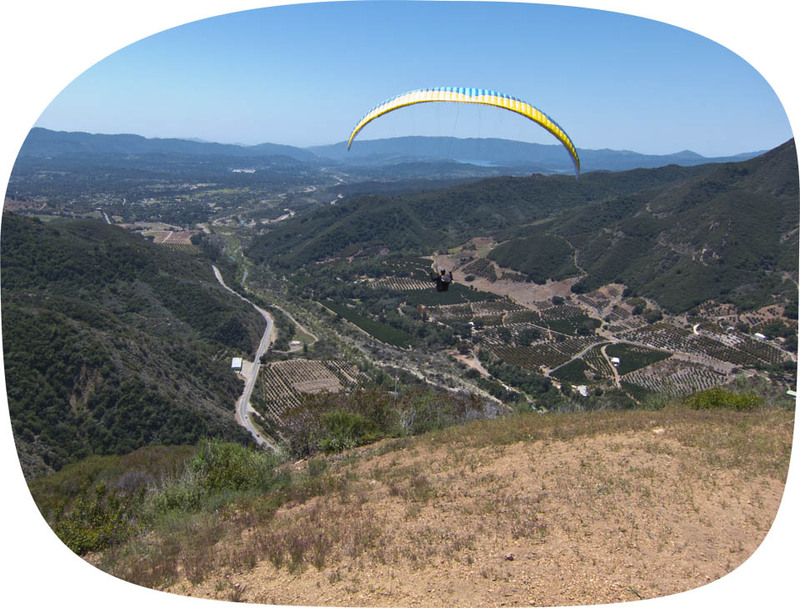 1) to fly westbound downwind toward Santa Barbara on days with east flow at altitude. 2) the afternoon lapse rate is usually better in Ojai than Santa Barbara because the Ojai Valley is more inland and less influenced by the ocean marine air, and the mountains are a couple thousand feet higher, so on weak days, Ojai may work good while SB can be a struggle. 3) some pilots like minimal mechanization and enjoy the satisfaction and rewards the Nuthouse offers after some healthy exertion climbing to launch. Personally, I won't hike if I can ride to one of the higher launches in a school bus, but there are days when the Nuthouse is flyable and it's not launchable at either Chiefs or Nordhoff due to north flow over the ridge (but there are north launches along the ridge). There is no site rating for the Nuthouse, but I think most pilots would considered it an advanced site for a number of reasons (like no designate LZ), so we recommend that you hook up with a local for your first trip. Chris Paul May 4th 2012 ↑ above, and Dr Andy Dainsberg on Jan 15, 1014 ↓ Below.